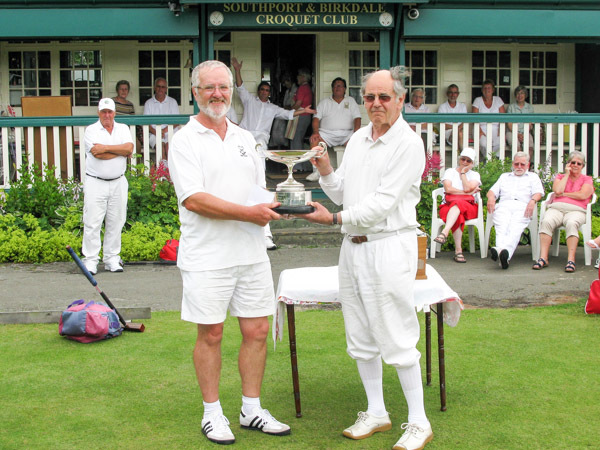 The first holder of the Jubilee Trophy, Andy Brandwood is back to defend it together with eleven others trying to stop him; Eileen Rossiter (18), Catherine Bass (22), Phillip Bass (22), Terry Vernazza (5), Eileen Gallagher (10), Joe Lennon (10), Janet Davies (14), Ian Smith (20) Fane Conant (18), Graham Good (16) Gareth Edwards (14). A beautiful morning, 8 Plummers, Andy got his Silver Merit Award. Blisteringly scorchio well before lunchtime. Philip misses Bronze as he looses by two. Afternoon tea cup cakes melting as it gets hotter. We are missing the storms in the South. Graham runs between long take offs like Usain Bolt, sometime arriving before the ball. What was in that fruit cake? Rossy delivers the tournament’s first twenty six nil to Andy , she had the short straw so they both finish the day on two wins. Some cool air comes in from the East. Graham, playing one ball, beats Terry to take the overnight outright lead. Three games still in play at 20:00, it is a nice evening, four players not in bare feet. Rain throughout the night clears for the start of play with an Easterly. The washing up bowl blows away rolling on its edge down lawn 1, judging by that it looks like 8 plummers again even with the rain. One or two injuries on show this morning, some arising from doing a Usain and others from the Blackpool nightlife. It is Barret 6, Pidcock 4, Wood Mallets NZ 1 and John Beech 1 by the way. Jet 2 takes off from Blackpool banking over the lawns, the Alecante passengers should be able to see the misplaced clip on lawn 3 from there. Opening a bottle of Willamette IPA does the trick, the first result comes in and it a win for Graham putting him in a strong position at lunch. Graham has beaten Andy in short order with bisques to spare and attracted the eye of the tournament handicapper with his high scoring 5/5. Clinical hoop running and rushing are Grahams strong points at the moment but gets away with a suspended sentence as his tactics are, well, lazy? He comes down naturally to 14, that is ok, well played and congratulations to a rising star. Elsewhere they are settling in for the long haul match. Mini Mouse has just turned up at the Tennis Club for a photo shoot. It must be hot in that outfit. Philip is on for a Bronze again, just needs to win the game. That means the result of Joe versus Janet, which started 24 minuets late, will decide the runner up and the sky is darkening with thunder clouds in the distance. Phlip gets his Merit Award as the rain starts, sending the wedding breakfast revelers inside the Tennis Club Bar. Mini appears to have been decapitated and this seems to please most of the children as they play football with her head. Janet is two ahead time goes, Joe misses. FCC Chairman Martin Bradshaw presents the trophy. So that is it until next year, thanks for tuning in. I am sure everyone will agree that a Croquet club bathed in Sunshine is a beautiful thing. But is there anywhere better than Southport on a weekend such as this one? The flowers around its club house looking splendid, the lawns tending to be fast(ish) and the company of talented players enjoying themselves and having some fun. Manager J Haslam split the entries into two blocks. This gave everyone nicely balanced and usually interactive games that could be enjoyed by the knowledgeable catering brigade who, after producing such a fine array of gourmet food (honestly), watched into the afternoon from the shade of the veranda. After the second game on Sunday two local lads came to the top. Alan Pidcock unbeaten in all his Super B games and Ray Lowe runner up. 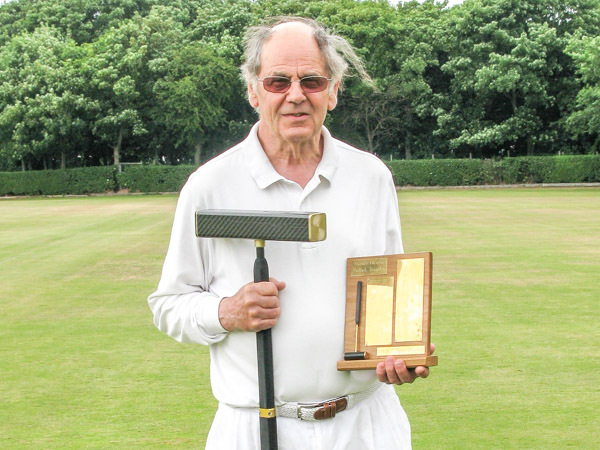 Fylde Croquet provided both the b class winner , Terry Vernazza, and runner up Liz Wilson. Players also came from far and wide to avail the local life in Southport overnight which was in full seaside swing during this glorious weekend. 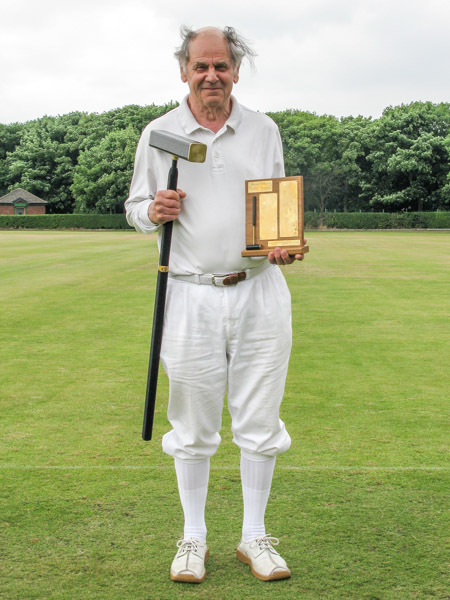 The North West made a clean sweep of the croquet trophies at the B Level and Super B tournament held at Southport this weekend. Derek Knight of Beverley, winner of the competition in 2011 and 2012 returned aiming at a hat trick, but could not repeat his success of previous years. This B Level tournament is split into a Super B and a B Level and attracted players with handicaps up to 6, so providing an opportunity for players to compete at their own level of advanced play. Players came from Lancashire, Yorkshire, Tyneside, Nottinghamshire, Shropshire and Surrey. Southport members proved up for the challenge with Carole Lewis top of the leader board at the end of the first day but by Sunday evening, Super B honours fell to Southport’s President, Professor Alan Pidcock, world renowned designer and manufacturer of mallets, with Southport’s Ray Lowe as runner up. 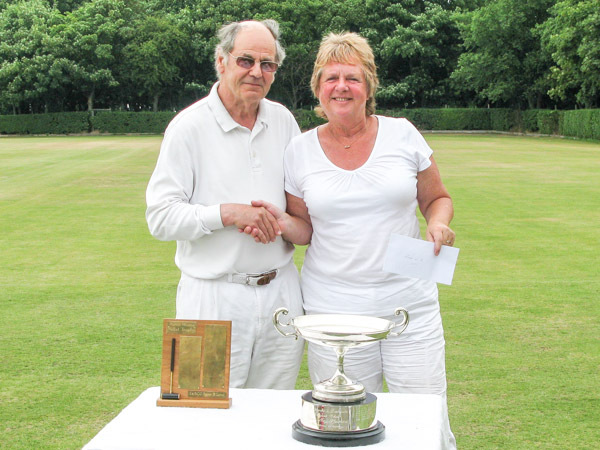 Whilst the B Level cup was won by Terry Vernazza of Fylde with the runner up Liz Wilson, also of Fylde and Chairperson of the North West Federation. Liz summed up the feelings of players, saying, “It is always a pleasure to come to Southport, it has a wonderful atmosphere and everyone is always very friendly”. 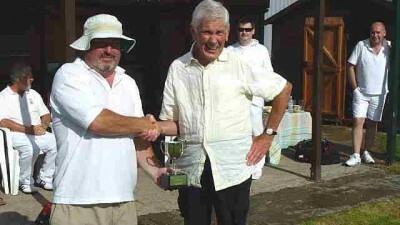 In one of the hottest weekends of the summer, players enjoyed a wonderful tournament, well managed by John Haslam. As always, the catering was simply excellent. The lawns continue to show further improvement since the club took total control of their management and are now virtually weed free under their organic programme of maintenance. 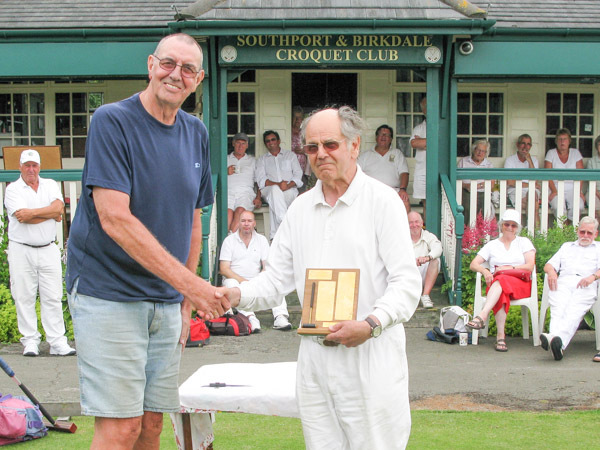 Terry Vernazza being presented with the B Level trophy by Southport President Professor Alan Pidcock. Southport President Alan Pidcock presents Liz Wilson with the B Level runners up prize. Thursday afternoon, a change of manager, and summer arrives at Pendle Croquet Club. Away go the waterproofs, out comes the sun cream. And newcomer Graham Good from Bury continues a run of play which will give him three of the trophies on offer for the week, earning himself a bronze merit award and a handicap reduction. He’ll be back. The class events were run as American blocks. Alan Edwards (Woking), with his consistent, steady play, was unbeaten in the A/B block. In the C class Bob Thompson (Nottingham) and Roger Staples (Middlesbrough) were tied on number of wins, but Bob took it by virtue of having beaten Roger. Graham Good was unbeaten in the D class. Graham also emerged top of the Egyptian competition, with Margaret Anderton (also Bury) a close second. 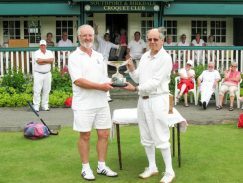 The doubles, a straight knock-out, was won by Roger Staples and Terry Vernazza (Fylde), who beat Ken and Margaret Anderton. Pendle Rose Bowl (A/B class): Alan Edwards David Jenkinson Tankard (C class): Bob Thompson. The Pennine Trophy (D class): Graham Good. The Irish Cup (Egyptian handicap winner): Graham Good. David Hoyle Trophy (Egyptian runner-up): Margaret Anderton. The Egyptian Cup (Fastest game): Graham Good (42 minutes). 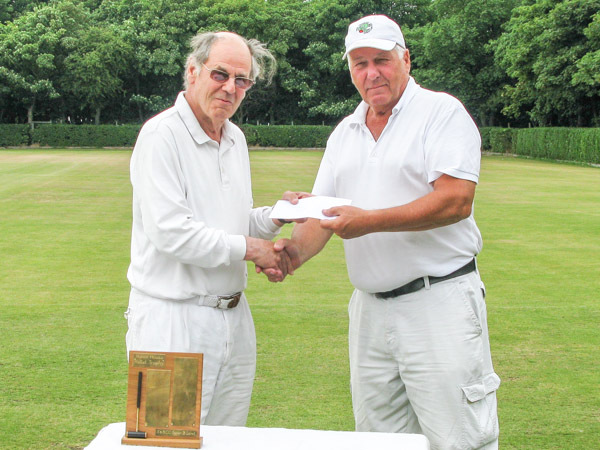 The Woodlands Trophy (Handicap doubles): Roger Staples and Terry Vernazza. The Addict (Most games played): Not awarded. Several people tied on 11. Graham Good 18-16; Janet Davies 14-16; Joe Lennon (Scottish CA) 9-10; Peter Moore 1-1.5; Margaret Anderton 12-11.